My son got through his first week of school last week, and it went wonderfully. He’s been making new friends, doing well with his school work, and he loves his new teacher. He’s showing an interest in guitar and wants to sign up for lessons. Hopefully he’s got the family musical gene because even with years of piano lessons, it seemed to skip me. He’s also trying to decide what sport he wants to participate in. He’s got it narrowed down to soccer and T-Ball. He’s not the most athletic kid, but he loves to have fun. Personally, I’d like to see him do T-Ball because it looks like so much fun, and we also already have all the equipment that someone gave us a few years ago. With all this going on, and the new baby, it looks like it’s going to be a pretty busy school year. So to keep things going as smoothly as possible, I try to meal plan as much as I can. But we all know those plans sometimes just go out the window. We’re either too tired or too short on time to always make a big dinner. That’s why I always stock my freezer with foods that can be made into quick and simple dinners. I’m always looking for new ideas as I browse the freezer section for quick and simple meal solutions. 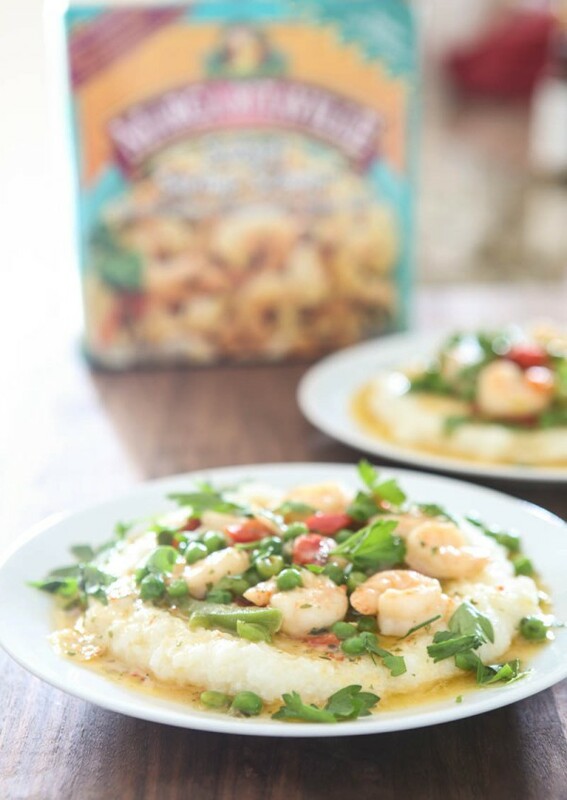 It’s certainly easy to grab a frozen pizza or lasagna – and I often do – but if I take a second to stop, think and look around, I can also find the ingredients for wonderful meals like this simple Sunset Shrimp and Grits dinner. Growing up in a southern family, and close to the Gulf of Mexico, I have a love for shrimp and grits. But in my family, my mom didn’t just make plain old shrimp and grits; she always added lots of healthy, colorful veggies for taste and nutrition. This shrimp and grits is made much like my Mom’s, except it took me only minutes to prepare. 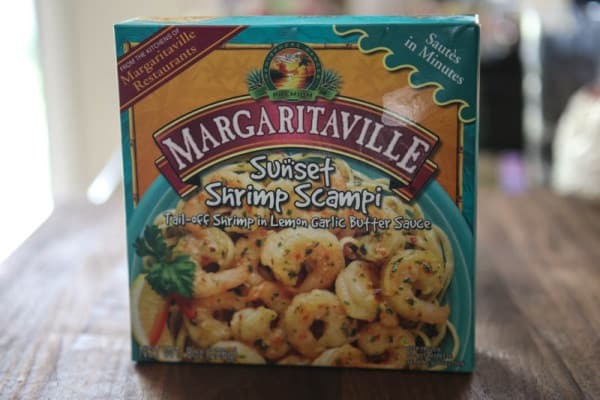 I start with Margaritaville Sunset Shrimp Scampi. 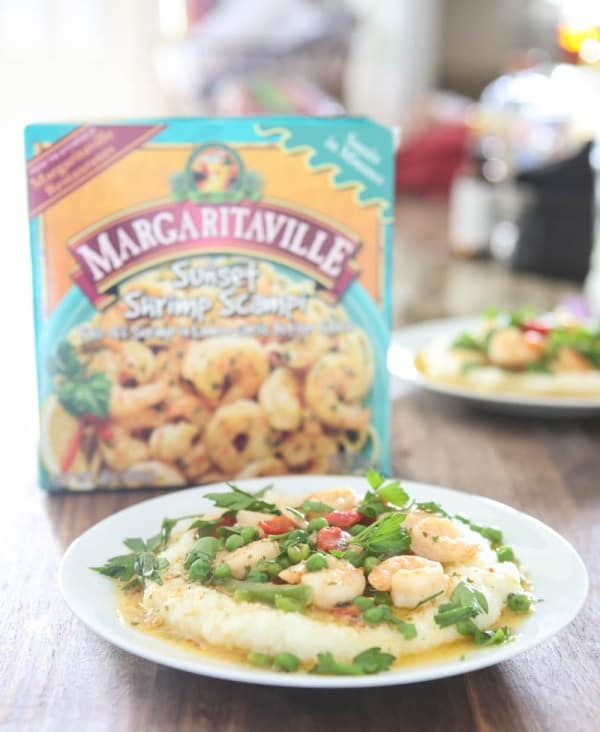 There are several Margaritaville seasoned and sauced shrimp varieties to choose from located in your grocer’s frozen seafood section that would work well in this dish. Just pick your favorite flavor and voila! Then, I serve this over my grits and garnish with fresh Italian parsley. You can even garnish with fresh lemon slices, and you’re done. It’s so easy, and dinner is on the table in less than 15 minutes! The freezer aisles are filled with lots of simple and delicious meal solutions like this one. There’s healthy produce, perfectly-portioned meals and a variety of ethnic cuisines and dishes to meet various dietary needs/culinary preferences. Real, simple, nutritious, delicious, affordable and customizable meals can all be found in your grocer’s freezer section. If you’re short on time, frozen entrées are expertly crafted by chefs from the freshest ingredients. They taste amazing and are a great option for busy weeknight dinners. 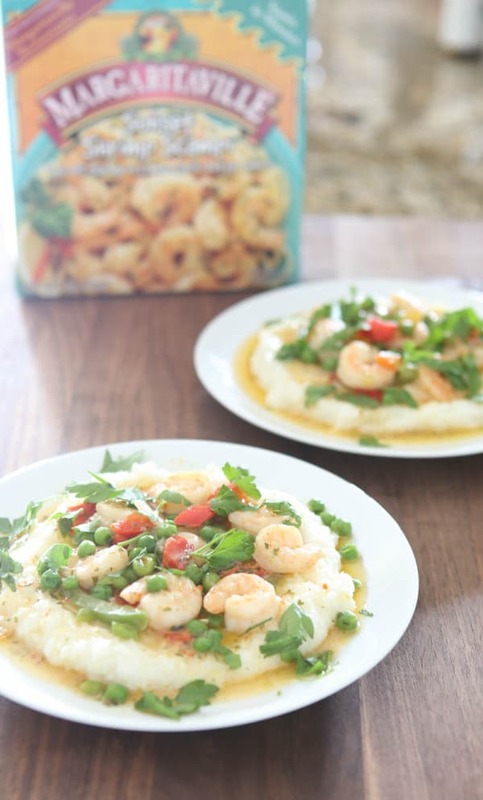 Adding frozen vegetables to meals like this Sunset Shrimp and Grits is so simple and tasty. 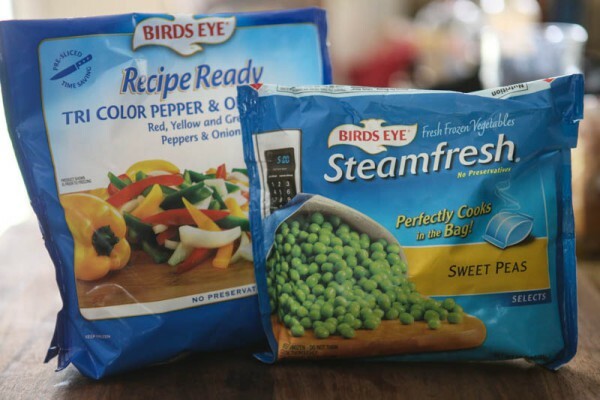 Frozen vegetables have great taste because they are captured at the peak of freshness, right from the moment they’re harvested or procured. There’s no waste either because you can use only what you need and put the rest back in the freezer. Below I’ve included my easy recipe for southern grits. This recipe is for 4 servings, and pairs with 2 packages of Margaritaville shrimp. Bring water, milk and salt to a boil over high heat in a medium saucepan. Slowly whisk in grits and whisk well until combined. Turn heat to low and continue to stir occasionally for about 15 minutes, or until grits are completey cooked through and have thickened. Whisk in butter and Parmasan cheese. 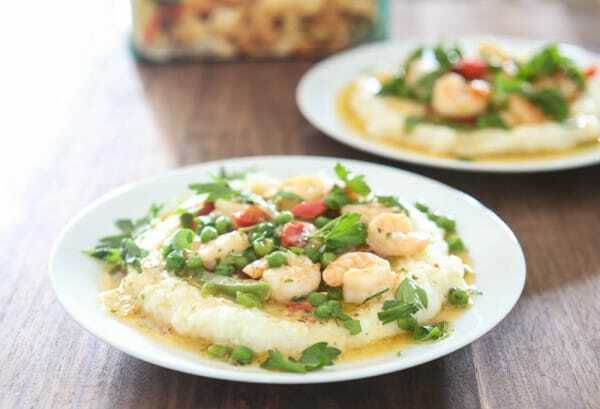 Serve grits topped with Margaritaville shrimp and veggies. I love shrimp and grits and I love these easy short cuts for the margaritaville shrimp and grits! Oooooh yum, what an awesome idea! I love me some shrimp and grits, so I’ll be picking up a couple bags of this next time I head to the store. I’m a Midwestern girl born and bred so grits has never been something I gravitate to. Until this! I think I need your recipe in my life ASAP! Pinning! Having a few quick and healthy freezer meals on hand is always a good idea–especially at the begining of the school year. This Northern Girl loves just about anything served on top of grits. How fun that your son wants to take up the guitar! That’s an instrument that I’ve always wanted to play. I’ve never served grits to my family, but that needs to change, starting with this recipe. I love me some shrimp and grits! Love the twist on this one.